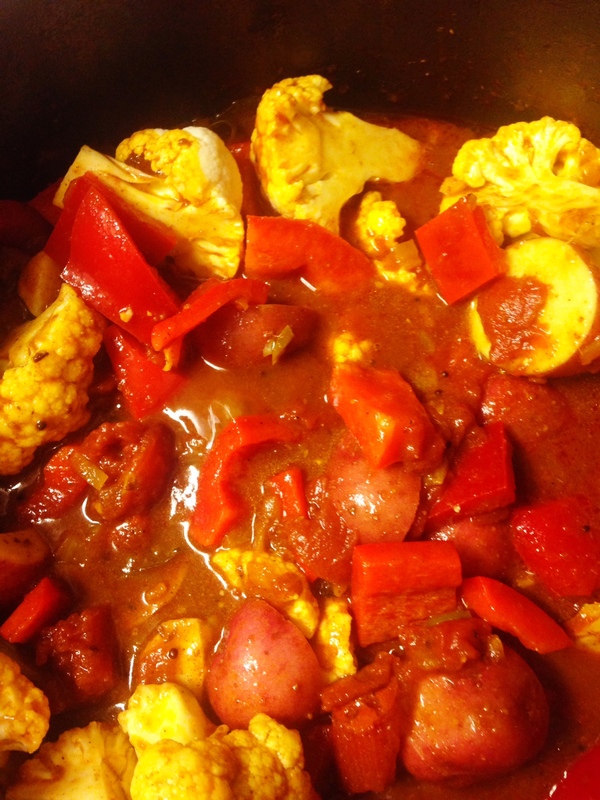 Aloo Gobi Vindaloo (Potato Cauliflower Vindaloo) – One Half Indian. My husband gave me the Plenty cookbook by Yotam Ottolenghi for Christmas, and I have been slowly cooking my way through it. 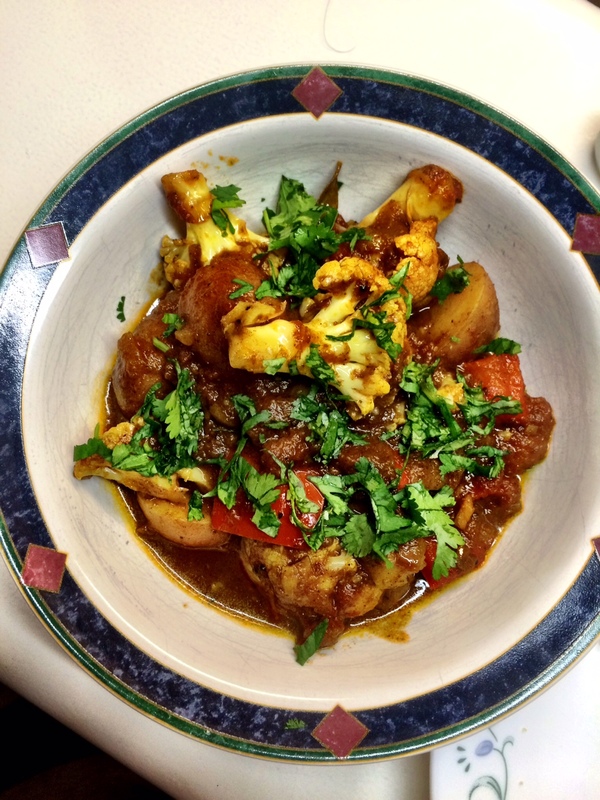 Since Vindaloo is an Indian dish, we had to try this recipe though I did change a few things. The dish was a bit sweet for my taste and I adapted the ingredients to match what I could buy in our local grocery store/what I had in the cupboard. Instead of shallots I used onion; instead of red chile I used jalapeño. 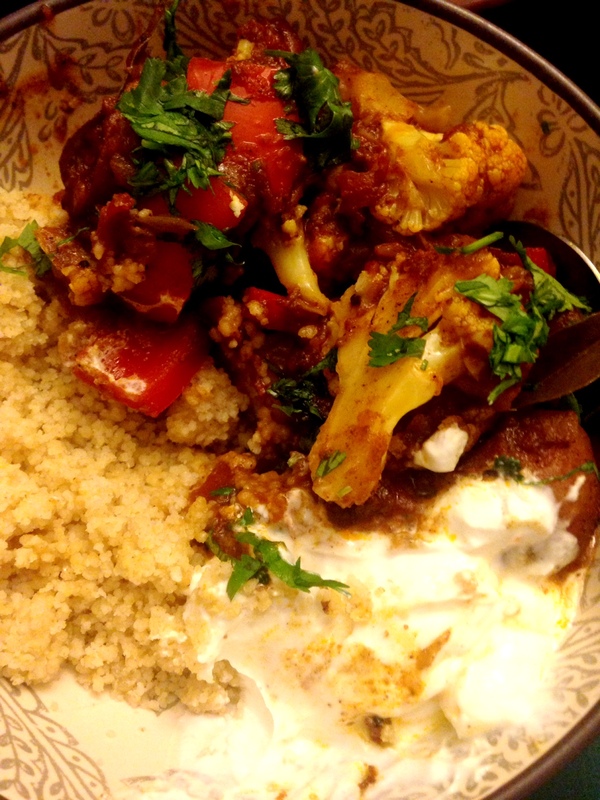 We thought this dish was pretty banging or to use my new Hindi phrase “dhaasu.” Below is my spin on Ottolenghi’s Vindaloo. Phew! That’s a long list! Dry-roast the cardamom pods, cumin seeds, and coriander seeds in a frying pan on medium heat until they pop (about 1 minute). Be sure to only add the spices once the pan is hot. 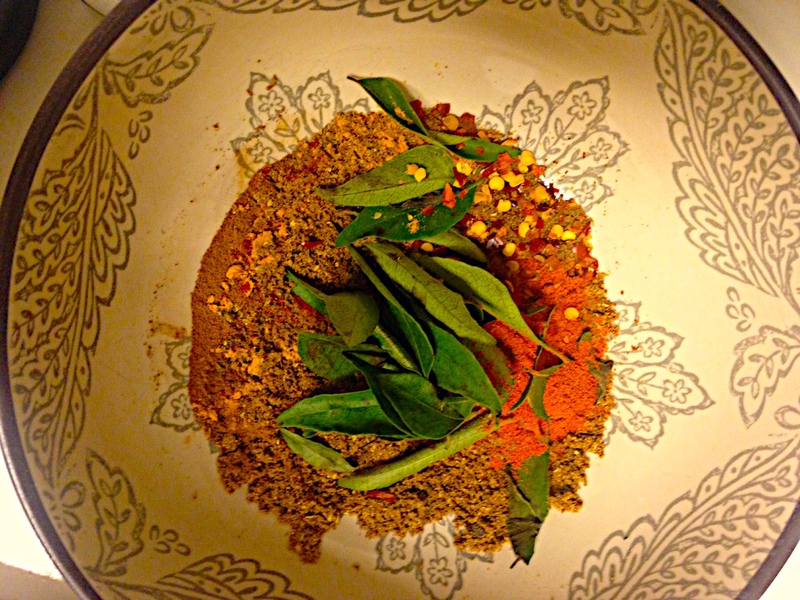 Transfer toasted spices to a mortar and pestle or a spice grinder; add in the cloves and grind the spices into a powder. Remove the cardamom pods once the seeds are released. Add the turmeric, paprika, and cinnamon. Heat the oil in a large pot (I think dutch ovens are great for this type of dish, but we only had a soup pot when making this dish and it worked fine). Add the onion with the mustard and fenugreek seeds and saute on a medium heat until the onions begin to brown (about 8 mins). Add the spice mix, curry leaves, ginger, and chile to the pot and cook for another 3 minutes ish. Add the tomatoes, vinegar, water, sugar, and salt to taste (I added about 2 tsps, but I am a salt lover). Bring the mixture to a boil and leave to simmer, covered, for 20 minutes. Add the potatoes, cauliflower, and bell pepper to the pot. The vegetables should be just immersed in the sauce. If you need more liquid, you could add more water at this point, but just enough to have all the vegetables touching some liquid. Continue simmering, covered for about 30 minutes longer or until the potatoes and cauliflower are fork tender. Maybe stir it a few times as well. Or not. If your sauce is thin for your liking, take the lid off and let the vindaloo cook uncovered for 5 or 10 minutes so that it can thicken. Serve hot and garnish with cilantro. We served ours with couscous and a dollop of yogurt, but basmati rice would really be ideal with this dish.